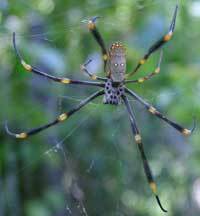 The Golden Orb-weaving spider is named after its golden silk web. The full image also shows the far smaller male above her, and several "packages" of her catch. The golden web has layers in front and behind to protect her from birds. While not being neat and well maintained, the web is effective for its purpose. 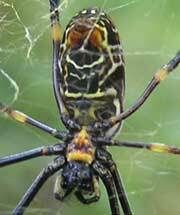 The body of the female is about 25mm in length; the male around 5mm. Here's another image of a gravid female. 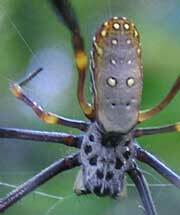 The back of the Golden Orb-weaving Spider seems like space craft or battle-wagon. Underneath it looks painted or camouflaged. 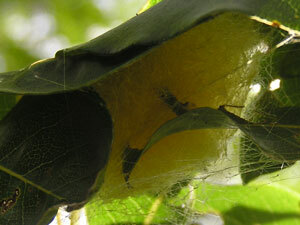 The golden egg sac is built away from the web. 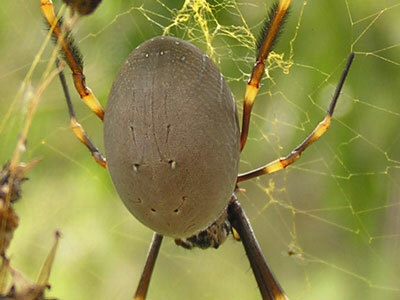 The one shown was found two metres above the web. It is not dissimilar to a silkworm's cocoon. The male is brown in colour and is a fifth of the size of the female. 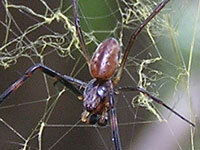 No, the male doesn't have six legs - this one probably lost his in pursuit of the female.